Air fried french fries taste just like the oil fried counterpart but they don’t have all the fat. This air fries recipe makes french fries that are crisp on the outside and light, fluffy, and tender on the inside. All with very little or no oil. Air fries are crisp on the outside and fluffy on the inside! I don’t deep fry food in oil very often. As a matter of fact, to date, I have not posted any deep fried recipes on this blog. I just don’t typically cook that way because I find it a bit messy and I try to avoid eating fried foods. I do, however, like to splurge on an occasional fried delicacy and French fries are one of my favorites. I would eat them more frequently if they weren’t so naughty. This is where my little friend the Air Fryer comes in. Air fries are a healthy version of French fries. Since you do not need as much oil to cook them, they have less fat and calories. Technically, you can make air fryer french fries with no oil but you will get even better results if you use a small amount of oil. An air fryer uses very hot air to cook food. As the air circulates at a high speed around the food it quickly seals the exterior and gives it a crunchy crust. They work similar to a convection oven and cook food faster than a traditional oven. Since Air Fryers are much smaller than a normal oven, they will pre-heat faster but it also means they cook smaller batches. 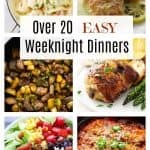 Do air fryers make food crispy? Air fryers will make food crisp but don’t expect the exact results as deep fried food. Take these air fries for example. They will be super crispy as soon as they are finished cooking but if you let them sit for 5 to10 minutes they will lose most of the crispiness. Deep fried French fries will do the same thing if they sit long enough but they can sit for a little longer than air fries without getting limp. Tip for THE BEST air fries recipe! Do you soak your potatoes in water before frying them? Giving the spuds a bath is supposed to make them crispier when they cook but we have an even better way to make the ultimate fries. If you want to “one-up” your air fries, cook them before you air fry them. You actually only need to partially cook them (or par-boil them) by giving them a quick dip in boiling water. Now that may seem like too much trouble but if you want the ULTIMATE fluffy texture, you have got to try this tip! If you partially cook the cut potatoes before you air fry them, the inside will be even fluffier and the outside will be crispier. 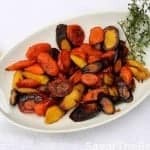 It’s a trick used by the best chefs and it is easy to do. Just bring a large pot of salted water to a boil then toss the potato strips in the water. Boil them until they are 1/2 cooked. Depending on how thick the potato strips are, it only takes 2 to 3 minutes. When they are finished boiling, drain them in a colander and let them sit until you are ready to make the air fries. Crispy air fried French fries! More Important tips to make amazing air fries! 1. Pre-heat the air fryer! Don’t skip the pre-heat. Putting the potato strips in a cold air fryer will make them heat slower. Get your air fryer nice and hot BEFORE you add the potatoes. That way the instant heat will put a quick ‘seal’ on the outside of the air fries and get it nice and crispy. Pre-heating the air fryer also helps the air fries cook more evenly. It only takes about 3 minutes for most air fryers to come up to temp so don’t skip this step. 2. Cut the fries the same size. Try to cut the potatoes strips as evenly as possible. If they are uniform in size, they will all cook in the same amount of time. If you want to be super precise, you could use a French fry cutter. 3. Don’t overcrowd the air fryer basket. 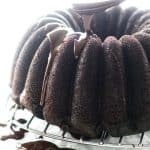 Most air fryers aren’t designed for large batches. Their small size helps them heat up quickly and cook quickly but it limits you to making smaller batches of food. If you fill the air fryer basket too much, the air will not circulate around the food as well and your air fries will be soggy fries. We used a large GoWise Air Fryer which holds 4 servings of fries in the basket. That’s a pretty large air fryer and they come even bigger, but most air fryers are much smaller. We started with one that only held enough for one serving at a time. The amount of food you can put in your Air Fryer basket will depend on the size of your Air Fryer and what kind of food you need to cook. For French fries, you can fill the basket fairly full but you will have the best results if you do not fill it more than 3/4 full. Air fryers do a pretty good job at circulating air around the food but you still need to help it out a bit. Once or twice during the cooking time, open the drawer and give the basket a shake to redistribute the fries. Shaking them around will keep the potatoes from sticking together and ensure that they cook evenly. 5. Choose the right potatoes. Select potatoes that have a higher starch content like Russet, Idaho, Yukon gold or Kennebec potatoes. The grains of starch in these potatoes will swell up when they get hot. That will create a lighter, fluffier texture on the inside of the fries. Waxier potatoes like red potatoes or fingerlings won’t give you the same result. That doesn’t mean you can’t make air fries with them. 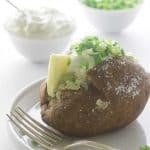 You can use this air fries recipe for waxy or starchy potatoes. Just know those waxy potatoes won’t give you the best texture for fries. 6. 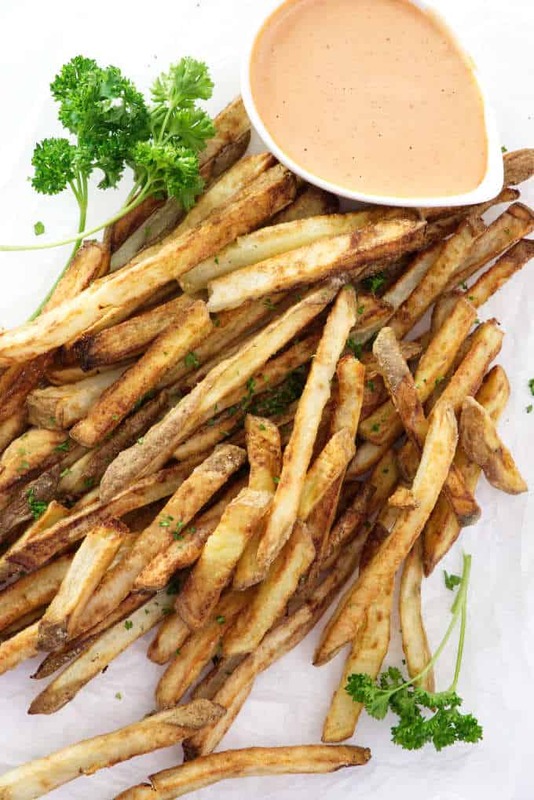 Serve Sriracha fry sauce with your air fries! 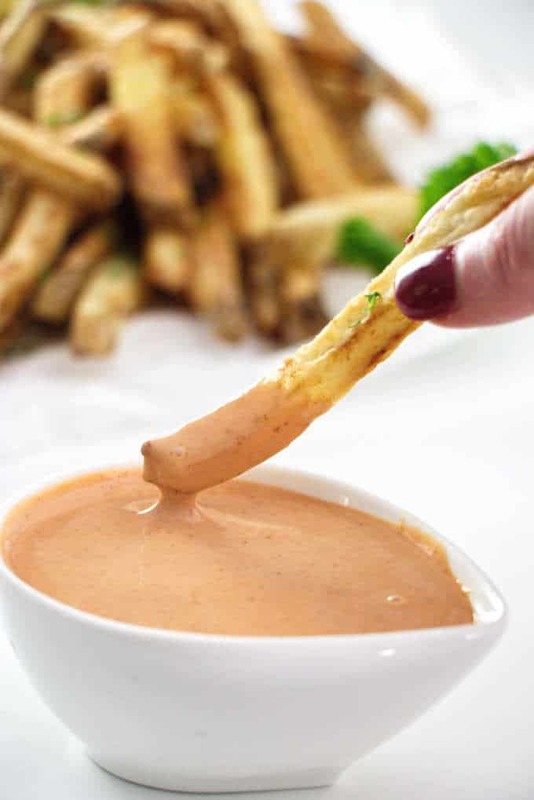 Try something different than ketchup and whip up this amazing fry sauce recipe. 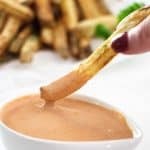 Fry sauce has the tang of ketchup, the creaminess of mayonnaise and the zippy zing of special ingredients. It makes a great addition to this air fries recipe. 7. Eat them right away!! The air fries will come out of the Air Fryer nice and crispy just like deep fried fries. But as I said above, they won’t stay that way. The longer they sit, the limper they get. 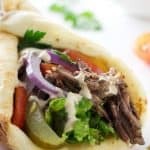 But don’t worry, if you make them too far in advance and they get too soft, just stick them in the Air Fryer for about 3 or 4 minutes and they will crisp back up. We like the skin on our French fries so we don’t usually peel the potatoes. It’s a matter of preference though so if you want to peel your potatoes first, then peel away. 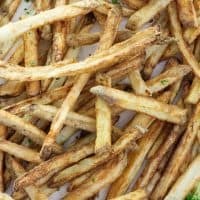 Can you make air fryer French fries with no oil? You can make this air fries recipe without using any oil at all but they honestly will turn out better with a little oil. This recipe only calls for 1 tablespoon of oil. You wouldn’t think that such a small amount of oil would make much of a difference but it does. That tiny bit of oil helps the air fries brown more evenly and helps salt or other seasonings stick to the fries. One tablespoon of oil will add an additional 30 calories and 3.5 grams of fat per serving to these Air Fries. It is a small price to pay for a big return on flavor and texture. Serve these air fries hot! These gluten-free zucchini fritters are full of cheesy goodness! These fondant potatoes get a long slow braise in the oven and come out super creamy, melt-in-your-mouth delicious! Sweet potato hash is perfect for breakfast. Top it with an egg and your set! Did you make this air fries recipe? We would love to hear from you. Drop us a comment below. Watch our video above to see how easy it is to make these air fries! Air fried French fries get par-boiled then quickly cooked in the Air Fryer for the best air fries ever! They are crispy on the outside and fluffy on the inside. Bring a large pot of salted water to a boil and toss the potato strips in the boiling water. Boil for 2 to 3 minutes or until the potatoes are half-way cooked. Do not cook them more than half-way or they will break up easily in the Air Fryer. Drain the potatoes and pat them dry with a kitchen towel. Preheat the air fryer to 400°F. When the air fryer is hot, add 1/3 to 1/2 of the potatoes to the fryer basket and cook for 15 to 25 minutes (see notes). Once or twice through the cooking time, pull the basket out and give the potatoes a good shake to redistribute them. When they are finished cooking, sprinkle them with salt and serve immediately. 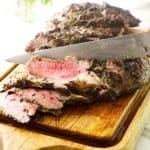 If they sit and cool down before serving, stick them back in the hot Air Fryer for a few minutes to crisp them back up. 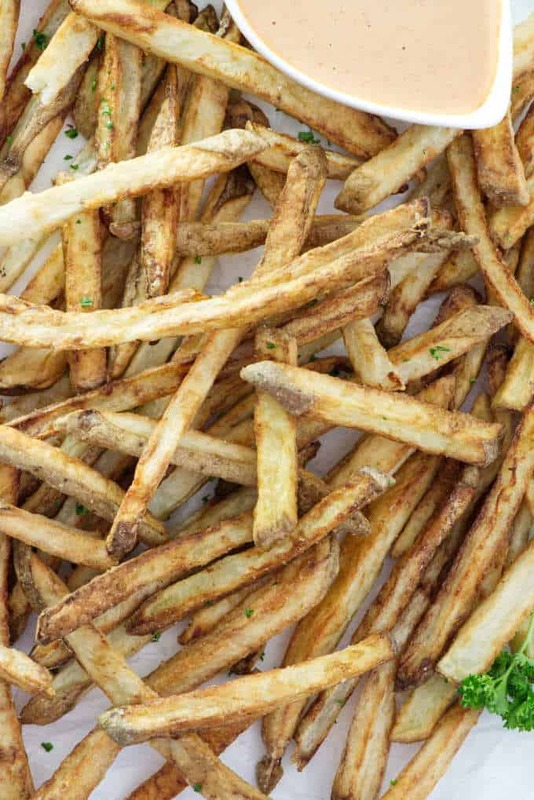 Choose Russet, Idaho, Yukon gold or Kennebec potatoes for the best fries. The cooking time is based on thinly sliced fries at about 1/4 inch thick. If you slice your fries thicker, they will need to cook a little longer. 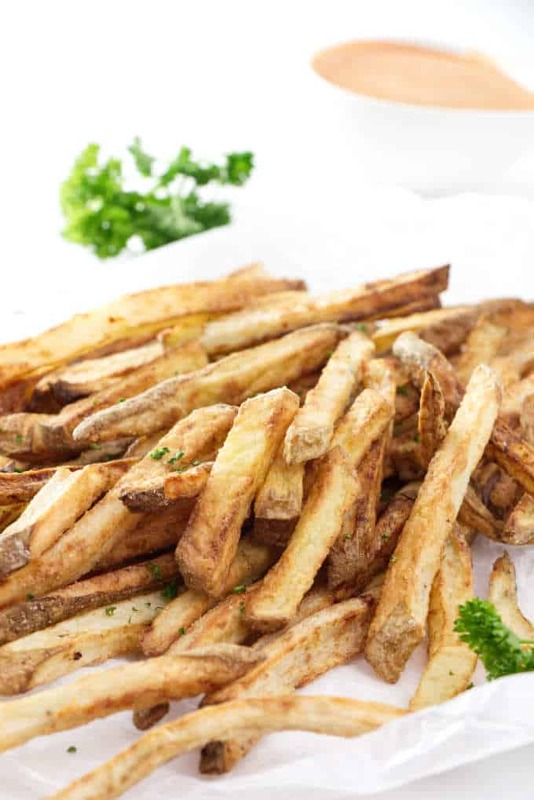 The more fries you put in the Air Fryer basket will also determine cooking time. Larger batches will need more time to cook. Try to cut the potato strips as evenly as possible so they all cook in the same amount of time. Par-boiling the potatoes will make them fluffier on the inside and crispier on the outside. If you do not par-boil them first then you will need to increase the time you cook them in the Air Fryer by 5 to 8 minutes. Do not over-fill the air fryer basket. Cook in batches that are appropriately sized for your Air Fryer. A larger Air Fryer may be able to handle the entire batch at once but a smaller Air Fryer may need 4 separate batches.